Lymington, UK--10th May 2016--From milkman to author, Lymington to Moscow, James Marinero has great stories to tell. His latest thriller, ‘Sicilian Channel’ is published today. This story reflects the upsurge of Islamist terrorism in North Africa - the Maghreb or Barbary Coast - attacking the ‘soft underbelly of Europe’ (Winston Churchill’s phrase). Steve Baldwin has sailed to Crete in his search for a quiet life. The Royal Marines had been his family, but now he is alone again - until he meets a waitress with a murky background. To avoid entanglement, Baldwin sets sail for Malta where he is dragged kicking into the pursuit of a psychopathic female assassin - Maruška Pavkovic - with whom he shares some painful, bloody history. Islamist terrorism is spreading across the Sicilian Channel from the Maghreb into the soft underbelly of Europe - and Malta, with its Crusader history, is a key target. James’s books have a nautical theme replete with sharply-researched locations, cultural background and leading-edge technology. He has lived in Hampshire for 15 years and is based in Lymington. The sea has been in his blood since he was nine years old. He has worked in many countries and many industries - in Russia, Kazakhstan, the Middle East, Scandinavia, Europe and the US, from government to investment banking. With this background he is superbly equipped to tell his stories. He now writes and lives much of the time on his boat. James is available for interviews and appearances. For booking presentations, media appearances, interviews, and/or book-signings contact the editor. 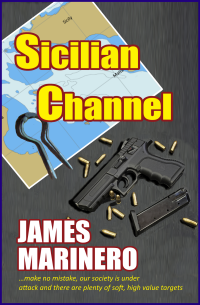 Ezeebooks UK publishes James Marinero's latest novel, Sicilian Channel.